Welcome to Education Info BD. Bindubashini Govt Boys' High school is most popular and remarkable school at Tangail in Bangladesh. I will try to discuss all details about this school. Now I am writing you about it's history, academic information, admission process, teachers name and contact address. I will discuss about admission process in this school. The school admission process are not difficult. If you which students admission in this school. Then you have must successful admission exam. Otherwise you will have some abilities. Any students admit this school. You will get GPA 4.00 in PSC exam for class six. And you have fill in the admission form. If any candidate than can be application form fill up. You wll know some information. Admission form must be fill up in just time. Passport size picture will upload with admission form. Any students will not change their address after admission. BB Govt Boys High school is most popular school for boys. It is situated in dighulia, Tangail. This school was established in 3 april, 1970. Which the school named of the Bindhubasini chowdhory name. Bindhubasini had Promoth Nath Ray Chowdhory and Monnoth Nath Ray chowdhory’s mother. They named of the school their mother’s name. Stadium place was donated for present school. Otherwise oddan and new market place was donated for this school. It is nationality 31 January, 1970. The government was helped the school in 31 january, 1970. It was an important place to the school’s. It generally sits by the side of a road. About 5 years this school was administrated in money problem. Here I am telling you academic information in this school. 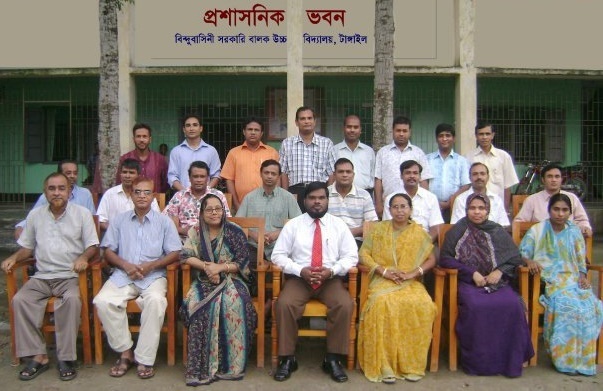 BB Govt Boys High school is public school for boys in Tangail city. This school has about 1900 students . There are 53 higher educated teachers for all subjects. The school all teachers and students are friendly. It education system is very well. This college place are peaceful. There are natural environment. This school has a very big field. Where students are play football and cricket. These school outside are looking great. The school has in front of a shohid Minner. Where are arrange international mothers language day every year. These school has nine academic vobon. Otherwise these school has also many games competition. Which students can spend their over time. There are big library for all students. The students can take their needed books easily. Which improve their general knowledge. Otherwise this school arrange cultural program. These program attend all students and teachers . It also arrange sqaoting program every year . And they win the prize for all programs. The school celebrate the victory day and pohela boisakh. These school has language club and science club. Which can help to progress their skills. Now I am writing here department of BB high school. The school has main three department. Every department are. Here I will have written you about this school education system. The school education system are best from others school. The school every teacher are higher educated. The teachers take their class regularly in just time. And all the students do the class attentively. These school teachers and students relation are good. There are extra care for weak and unconscious students. Education progress and improve are discussing with guardian. These school teacher are take class with multimedia and digital process. Every teacher collect their class regular from every students. Otherwise the school has take tutorial exam and monthly exam. Which every students can progress and improve their knowledge. The students should have attend their class regularly. And must have attend their tutorial exam and monthly exam. If any students are not attend this exam. Then you have must be fine. Now I will write here some educated teachers name in BB high school. The school teachers name are give. Here I will write you full address about this school. If you contact this school , you will see school address properly. Then you will go to the school easily. If you want more details about BB Govt Boys High school. Then you stay with us. Thanks for our visiting our site.